I was just going though the past issues of ST-Log. In reading the previous ST User columns I noticed something peculiar. There is an excellent product that I use each and every time I turn on my ST, but I have failed to mention it even once. It is DeskCart! from QMI. DeskCart! is a desktop accessory cartridge for the ST that simply plugs into the cartridge port on the computer. The cartridge contains a battery-backed-up clock and 14 desktop accessories. What is remarkable is that DeskCart! only takes up 84K of computer RAM (Random Access Memory). The battery-operated clock/calendar sets the system date and time of the machine and loads automatically. The 14 accessories are all contained on a 64K ROM (Read Only Memory) in the cartridge and are contained under one accessory called "DeskCart!" Since the maximum number of allowable accessories on the ST is only six, QMI cleverly used only one desk accessory entry so you could use other accessories as well. The 14 accessories include: a calendar with appointment scheduler and alarms; multiple notebooks with fullscreen editing; a full-featured calculator with either mouse or keypad entry; a card filer with sorting, searching and printing functions; a typewriter function for quick labels and envelopes; an address book with searching and auto-dialing; a VT52 terminal emulator; keyboard macros for use with just about any program; a fast and resizeable RAMdisk driver; disk utilities including format, copy, delete and rename; a print spooler; a more complete control panel with load and save options; a screen dump to any graphics printer and a system memory test. DeskCart! is always plugged into my ST. If nothing else, I use it for the battery-operated clock. But there are also a couple of the accessories that I use a lot. The calculator is one of them. It is a multi-function scientific and programmer's calculator, meaning that it has exponential notation and scientific operators, as well as hexadecimal calculation and arithmetic logic functions. It contains 100 storage memories that are kept for as long as the current desktop session. Further, when you save the control panel, the storage memories are also saved. I like the convenience of being able to call up the calculator regardless of what I am doing at the time. If you are a programmer, you'll like the hexadecimal functions. It can do the following operations: 2's complement, left shift, right shift, arithmetic AND, OR and XOR (exclusive OR). The notebook is another accessory that gets heavy use. Notebook files are standard ASCII files and can be up to 12 pages long. When displayed on the screen, the vertical slide bar includes the page number which is a useful touch. When you click on the notebook accessory, a window opens up with five icons across the bottom. Load and Save allow you to store and retrieve any notebook file from the DeskCart! File Selector. The File Selector is another nice touch from programmers John DeMar, Robert Dolan and Richard Gortatowsky. Across the bottom of the File Selector window is a row of drive letters. Clicking on the drive letter is a preferred alternative to using the GEM File Selector close window box to move up through directories in order to access another drive. Also, the DeskCart! File Selector allows you to sort the listing in the window by either name, date or size. The Print icon lets you print one or all of the pages from the currently displayed notebook file. The Find icon lets you move rapidly to the top or bottom of the document and the Erase icon wipes out the contents of the current window. Disk utilities is another useful accessory. Being able to copy, delete and rename files from within another GEM application program is very handy. Also, I can format a disk with the DeskCart! utilities and display the status of any disk drive. The screen dump is the other utility that gets frequent use. Although it is somewhat similar to the built-in GEM screen dump, this one allows you to print either vertically or horizontally. Also, you can load printer drivers from the screen dump window. DeskCart! lists for $100 (Quantum Microsystems, Inc., P.O. Box 179, Liverpool, NY 13088, 315-451-7747) and has been around for about two years. Although there are various individual utility programs available either commercially or via freeware that handle some of the functions of DeskCart!, I know of no other product with as many features as DeskCart! I can't imagine anyone using an ST that couldn't use even just some of the features of this program. I consider it the single best add-on product for the Atari ST computer. It would certainly make a nice holiday gift. There are two other products that are always attached to my ST system. Both of them come from Practical Solutions, and they are the Monitor Master and Mouse Master switch boxes. Monitor Master permits me to connect both a monochrome and a RGB monitor to the ST at once. By pressing a button on the front of the box, I can select between color or monochrome displays without having to hassle with disconnecting and re-connecting monitor cables. This doesn't relieve you from having to reboot your ST when you switch, but is nonetheless a time-saver. Monitor Master also provides a composite video signal (only on STs with an RF modulator) and an audio signal. The composite output is especially useful for the ST's low-resolution mode In fact, if you only have a monochrome monitor, you could get away with a TV for playing games on the ST. Monitor Master's video output is also useful to feed to a VCR. Just remember: the ST medium-resolution mode really requires an RGB monitor for clarity. Unfortunately, there is no way of getting around it. The other Practical Solutions product I use always is the Mouse Master. Mouse Master plugs into the two joystick ports of the ST and lets you connect a mouse and a joystick to Port 0 at the same time A switch on the top of the box switches between mouse and joystick. There is also a Port 1 (joystick) connection. If you have a 1040ST, with the mouse/joystick ports underneath the computer, you need Mouse Master. Monitor Master sells for $55, and Mouse Master sells for $40 (Practical Solutions, Inc, 1930 E. Grant Rd., Tuscon, AZ 85719, 602-884-9612). The good people at Practical Solutions tell me there will soon be (by the time you read this) a Drive Master that will allow you to switch between two disk drives—say an Atari ST drive and a 360K PC drive. Recently a couple of new games appeared on my doorstep. Naturally, in the interest of journalistic research, I immediately ran down to the "computer center" (it used to be a normal basement before the invasion of the machines) to begin some serious, scientific investigations on this software Of course, I had to postpone the chores I had planned for the day. Hey, this is science. "Speed Buggy by Data East, is a driving game that offers five race courses for you to master." 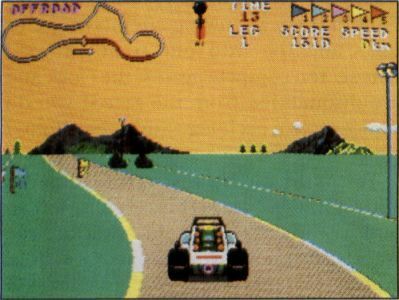 One of the new games is Speed Buggy by Data East. When I saw it at last summer's Consumer Electronics Show, I really wasn't that impressed, but I decided to check it out anyway. Whoa, this is one neat game. Speed Buggy is a driving game that offers five race courses for you to master. Four of them are racing circuits (more or less), and the fifth one is an off-road course. You compete against the clock and are disqualified from the race if you do not complete each leg within the allotted time. You must race across terrain littered with boulders, trees, brick walls, fences and a whole lot more. In addition, the track continues through narrow valleys, across even narrower bridges, through dark tunnels and past road construction (on your race track!). If you hit fences, rocks, walls or trees during the course, it will flip your car over (a nicely done animation) and slow you down. However, you can jump obstacles by hitting the logs that lay across the track which will send your buggy soaring through the air. You can also tilt the buggy on two wheels by driving over tree stumps or small rocks. This technique is useful for squeezing through narrow gaps. Along the course are gates, each of which is worth from 100 to 500 points if you can pass through them. Passing through a special "time gate" adds an additional two seconds to your next leg. There are also differently colored flags, each worth from 10 to 30 points. If you pick up the flags in the specified order, bonus points are awarded. I have long been a sucker for racing games, going back eight years to my early 2600 VCS days, so the genre and I are well acquainted. Speed Buggy is a nicely implemented racing game for the ST. There is plenty of challenge and the graphics are well-done. At first, I was oversteering and had a difficult time controlling the car, but one particularly nice feature of the game is the self-centering characteristic of the buggy. A light touch is all that is needed on the steering, especially at higher speeds. I highly recommend Speed Buggy regardless of whether you are or are not a hard-core racing-game fan. For about $30 (Data East USA, Inc., 470 Needles Drive, San Jose, CA 95112, 408-286-7074), Speed Buggy is worth the investment in fun. The other new game that arrived is Typhoon Thompson in Search for the Sea Child by Dan Gorlin. You may recall the excellent game that Dan wrote for the 8-bit Atari computer called Choplifter. It too was from Broderbund Software and ranks as one of the all-time best 8-bit games. One of the things that made Choplifter so successful was its detailed animation. In that game you flew a helicopter in order to rescue hostages behind enemy lines. As you landed the chopper, the people would run toward it waving their arms and screaming. Once you returned the hostages to the friendly U.S. position, they filed out, stopping to wave to you in thanks. When Choplifter first came out, the Iran hostage affair was still fresh in our minds. I don't know if that influenced my perception of the game, but I do know that the detailing of the characters was excellent. It was easy to identify with those little people on the screen. Another thing that made Choplifter so good was the control action. The helicopter was easy to fly. Indeed, it felt natural to fly. Dan Gorlin has brought both of those elements to Typhoon Thompson. 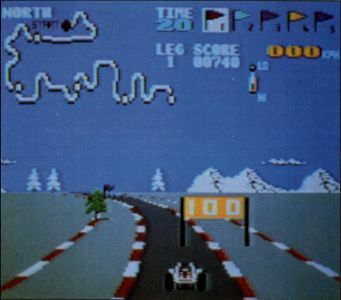 The first thing you notice about the game is that the control of your Jet-Sled is very fluid, The craft responds quickly to the slightest movements of the mouse. It leans and moves in whatever direction you move the mouse, and you soon learn to anticipate the control actions. About the game: It seems that a child survivor of a passenger transport exists somewhere on the unchartered ocean planet Aguar. The Sea Sprites, who live in these tropical waters, have hidden the child and must be outwitted if you are to succeed in your rescue attempt. The Sea Sprites use different kinds of Flyers [sic] as their defense. They range from the benign Bumper which just pushes your sled around to the fatal Zapper who can vaporize you in a flash. "A high score roster is provided so you can compete with yourself or your friends"
Spirit Guardians from Aguar's long-dead civilization are there to help you but only if you provide them with the tools needed to rescue the baby from the impenetrable observatory dome. Each round requires that you retrieve one of the four artifacts. To do that you must capture all of the Sea Sprites from all seven islands within a village Once that is accomplished, you trade the captured Sprites for the artifact and return it to the Spirit Guardians. Each succeeding mission presents new and more difficult challenges. Greater numbers of Flyers attack from the island village, more Sprites must be captured and it becomes more difficult to capture the Sprites. Fortunately, the Guardians will arm you with additional, more powerful weapons in order to capture the elusive Sea Sprites. 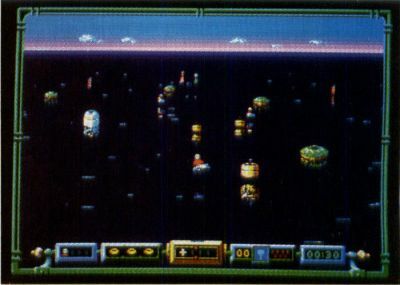 Your final score is based upon the number of tasks you complete, the number of islands won, the number of Sprites captured, and the amount of time it took to complete the tasks. A high score roster is provided so you can compete with yourself or your friends. With the challenging game play, 3-D graphics, quick animation and overall quality of Typhoon Thompson, there will be plenty of competition. This game is really addicting. Nice job, Broderbund! 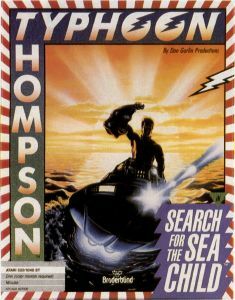 Typhoon Thompson is priced at $34.95 (Broderbund Software, Inc, 17 Paul Drive, San Rafael,CA 94903-2101,800-527-6263).